Most aspects of American life - eating, heating and driving - take more energy than the same activity anywhere else in the world. That explains the carbon footprint of the average American (19 tonnes of CO2) and that of the average Briton (9 tonnes of CO2). But I know that it doesn't have to be this way. Easily. Improved fuel efficiency standards for America's 250m passenger cars could cut US dependence on foreign oil, while cutting transport emissions and cleaning the air of pollutants that cause cancer and asthma. The Environmental Protection Agency estimates that transport contributes approximately 27% of total U.S. greenhouse gas emissions and is the fastest-growing source of emissions. In the EU, transport (excluding air and maritime) accounts for 19% of emissions. After five months of enduring transport paralysis - even though we only a couple of miles from San Francisco - my partner caved in and got her own car. A Toyota Prius was out of her price range, and the Japanese earthquake interrupted supply, making deals less attractive. So she opted for a less expensive, but less economical Honda Fit. The same model is called the Jazz outside the US. But although they are the same models, they are far from identical. 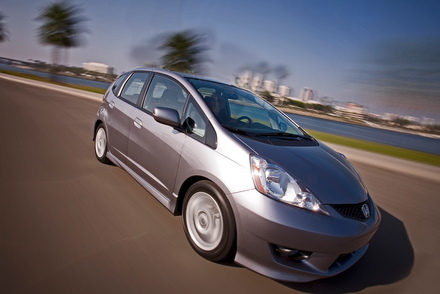 In the US, the EPA's mileage rating is between 28 to 35mpg for a Honda FIT. But the UK equivalent does around 52mpg. This is far from the most extreme example. Compared with most US passenger vehicles, the Toyota Prius is a shining example at 48-51mpg, but its EU counterpart runs at around 70mpg. But this site lists the MiniCooper as the UK's most fuel efficient car at 72mpg whereas the US equivalent is around 35mpg. Why is this? The thread here shows how much confusion there is over the explanations, and it is easy to see why when auto manufacturers keep information scarce. Automakers can't explain it because there really is no good reason. The US auto industry is one sector of the economy that has not kept pace with Asia and Europe. I agree that the different engine size should alter fuel economy and I know that the imperial size of a US gallon is smaller than the metric version. According to the car salesman at Honda Marin, the Japanese carmaker had to increase the FIT's engine size by .1litre because "Americans want more performance." He also said that the catalytic converters to make tailpipe emissions comply with US regulations on emissions also reduced fuel efficiency. Other "informal" explanations include the fuel mix with ethanol making the gas less effective. Parts of this explain the 20mpg difference, but surely not all. So I went to the American Auto Alliance for a more formal response. The press spokesman said: "speak to your Honda dealer". My gentle reminder that I had already done so was met with silence. So design variations between cars made in the US and overseas do explain some of the differences. But not all. Part of the reason why cars in the US have the same average mpg as they did 20 years ago is because none of the auto makers want to make the giant leap to fuel efficiency first because of fears of losing out to their competitors. Ford is nudging to the final frontier with its Eco Boost Focus, which gets 40 highway mpg. At a conference recently I was also told by a Ford representative that the automaker is designing engines that are smaller, but don't lose the performance that American consumers are so bonded to. Getting high performance from cars with a mere 2L in Europe is something that companies such as Mercedes and BMW have perfected over the past two decades. The Mercedes C-Class, for example, still manages 55mpg. Finding a car in the US with an engine size less than 2L is hard enough - that is the entry level size for most models and probably a quarter of the vehicles on my local highway are around 4 litres. The sheer lack of necessity makes me feel quite nauseous. The graphs in this EPA report on on fuel economy trends shows that although fuel efficiency has increased between 1975 and 2005, these savings are massively outweighed by the phenomenal rise in production of large cars, SUVs and "trucks". President Barack Obama promised to put 1m electric vehicles on US roads by 2015. There is no reliable source for this information. But I'll wage there aren't even 100,000 EVs on the roads in the US - excluding golf carts, of course. With huge obstacles yet to be overcome regarding range anxiety (US commutes tend to be further than those in the countries where EVs are designed) and charging infrastructure this strategy begs many questions when making the existing technology of the combustion engine more fuel efficient. The race to put 1m EVs on the roads will only end in tears if consumer, particularly on the east coast, are merely trading dirty oil for dirty coal-fired electricity to juice up their cars. Now that gas prices are pushing above $4 a gallon, consumers are thinking more about fuel efficiency. The equivalent cost in the UK would be $7.60 - a price unimaginable any time soon at gas pumps in the US given government oil subsidies. But one other large gap in the narrative from buying a car in the US are data on CO2 emissions which have to be provided by law in the EU. In the UK, there are incentives for downsizing your car, with road tax exemptions on new cars that turn out 130g/km or less of CO2. Ask a car dealer in the US about the CO2 of the cars he sells (and it is usually he) and he will look at you like you've gone mad. If you tell him that this information is a legal requirement in many other developed countries and will even help you reduce your tax bill, he'll be calling security. Welcome to my blog where I will share my thoughts on all the latest clean tech developments in California from a European perspective. In the absence of a globally binding agreement or federal policy on climate change, subnational governments, companies and non-profits are filling the void with great strides in clean tech & renewable energy and innovative approaches to climate policy & the transition to a low carbon economy. While the EU leads the world on climate change legislation, California and other west coast states are not without their own suite of innovative policies. Some of the best technological developments in renewable energy started in the US, but companies in Europe are leagues ahead in areas such as wave and tidal power. This blog aims to synthesise what's really happening between Europe and the US and what lessons can be learned from each side - and occasionally explain why some policies just don't travel well across the Atlantic. I am a journalist, and the discussions on this blog do not necessarily reflect the views of the publications I write for. I will use my blog to share nuggets of information that wouldn't fit in a news story, or my observations on the attitudes of government and the general public to climate change, transport and energy. As a Brit, I encounter something fascinating almost every day by living and working on the west coast of the US.